A straight staircase is easy to fit with a stairlift, but curved or multi-level staircases can pose real problems. That's why the AmeriGlide Platinum Curved Stairlift is designed to fit unobtrusively on almost any stairwell and handle curves and turns that a standard stairlift could never navigate. A two-rail system gives this lift more stability to gently move around curves and turns. 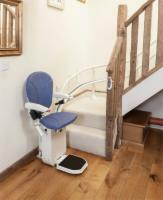 This stairlift can handle up to 264 pounds safely while offering a smooth ride on even the most complicated stairwell. It will be custom-built for your home's specifications to guarantee a perfect fit. In most cases, the stairlift will be installed on the stair treads instead of the wall for less construction mess and fewer changes to your decor. A fold-away footrest and drop-nose finish that takes up less space mean that your AmeriGlide takes up as little room as possible when not in use. You don't have to be confined to one level of your home. When you need a lift that can handle your staircase and that comes with great options like powered footrest raisers and powered swivel seats, choose the AmeriGlide Platinum Curved Stairlift.